You may have heard of "design-based strategy" or read recently how design-led companies are seeing great success. But if you're unfamiliar with the term and aren't a creatively-minded person yourself, you might not fully appreciate what it means or how it could affect your business. In reality, this approach to business can be extremely powerful and is something that your organization can take advantage of-if you have the right talent available. So what is "design thinking" anyway? Sarah Faulkner, Principal of Faulkner Strategic Consulting defines design thinking as "a form of solution-based thinking that starts with a specific goal and goes through multiple stages of iteration--divergence and convergence--to solve complex problems in a human-centered way." David Kester, Principal of David Kester & Associates defines design as "the connection between creativity and innovation." Tim Brown, CEO and President of IDEO describes design thinking's role in business "as a discipline that uses the designer's sensibility and methods to match people's needs with what is technologically feasible and what a viable business strategy can convert into customer value and market opportunity". There is no strict protocol or set definition for design-based methodologies or principles. However, it can generally be defined as a way for businesses to use creative or design-led ways to solve structural, growth, and innovation challenges. And businesses who adopt it properly are able to better engage customers and adapt to changes in the market. For instance; IBM places a big focus on design thinking to help meet their consumers' needs with a human-centered mindset. As a creative staffiang agency, we find that many companies are highly interested in employing a design-focus approach but lack the guidance on how to properly do so. That's why we place such a heavy focus on a thorough and extensive process when working with companies on a creative director executive search. The right creative leadership and talent are essential to adopting a design-based corporate mindset. The design of any product or service is the foundation of any successful invention or idea. The notable emergence of design thinking has surfaced mainly due to the mass of brands fighting to satisfy consumers and their growing and changing expectations. A design-led company strives to improve the customer experience and focuses every aspect of their strategy around the consumer. Companies that are design-focused integrate design into every aspect of their brand. Organizations that successfully do this drive innovation and successfully improve the customer experience. According to a study from Adobe led by Forrester Consulting, the benefits of being a design-led company prove to be well worth the investment. 41% of design-led companies attribute having advanced design practices to greater market share and 50% of companies report more loyal customers. Classically, designers have had one very narrow place in the business; a slice of the creative team operating in the marketing department. But designers-and design thinking-are capable of so much more. Don't limit design thinking into a small box or only one specific scope it can operate under. It isn't a one-step process - it should impact every element of your business and strategy, from user experience to product development to customer service and fulfillment. Whether it be developing the product or marketing it, design thinking should be adopted as a mindset for every aspect of your brand. A design-focused mindset needs to start from the top, with a cohesive vision for the brand and the workplace environment you want. Strong support from the top of the organizational hierarchy is necessary if the entire company strives to adopt design principles throughout the entire company. Once this is successfully accomplished, employees will follow. According to Adobe, 91% of design-led companies make design an integral component of their digital customer experience strategy. Just like design-forward thinking needs to be present among the culture of the whole organization, it must be able to support every part of the customer experience. Don't just implement design thinking during the start or end points of marketing - it should affect the entire process from beginning to end (and beyond). According to Adobe, 84% of design-led companies invest in tools and services to facilitate design. However one of the most effective ways in seeing desirable results with design-forward thinking is building a team of knowledgeable creative talent. Design-led companies need to have a reliable team of professionals that are design-driven to successfully drive business results and innovation. Your human resources are the essential starting point for any internal project or process so it's vital to have a strong talent foundation. Don't forget to partner with a specialized creative headhunter and recruiter to keep a steady flow of talent coming into your organization. Design-led companies need to encourage and facilitate collaboration between teams and departments in the organization. 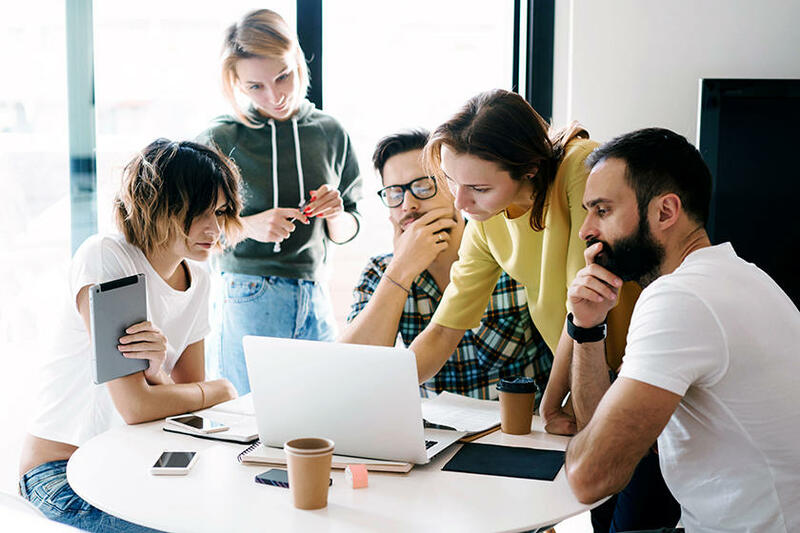 Supporting teamwork and a collaborative workplace environment where peers can share creative ideas will significantly improve performance and results. Facilitate seamless communication between different teams and drive design-thinking as an organizational effort. This has become a common platitude among marketers in recent years but it's often forgotten about when companies choose to focus more on their products and services. When we're in the process of creative staffing, we always look for people who recognize the importance of putting consumers first because at the end of the day, that's who it's all about. Think about it - if your consumers didn't exist, neither would your brand. The integration of business and design only succeeds if it revolves around the customer. So, when focusing on the creative or design element of a product or service, put yourself in their shoes to really get a feel for what their needs are and how you can satisfy them. And don't hesitate to get them involved in your design process - this can create impressive results! This article was written by Mark Miller from Business2Community and was legally licensed through the NewsCred publisher network. Please direct all licensing questions to legal@newscred.com.